Asbestos Removal Technologies Inc., job superintendent Ryan Laitila, left, sprays amended water as job forman Megan Eberhart holds a light during asbestos abatement in Howell, Michigan, Oct. 18, 2017. Spurred by the chemical industry, President Donald Trump’s administration is retreating from a congressionally mandated review of some of the most dangerous chemicals in public use. 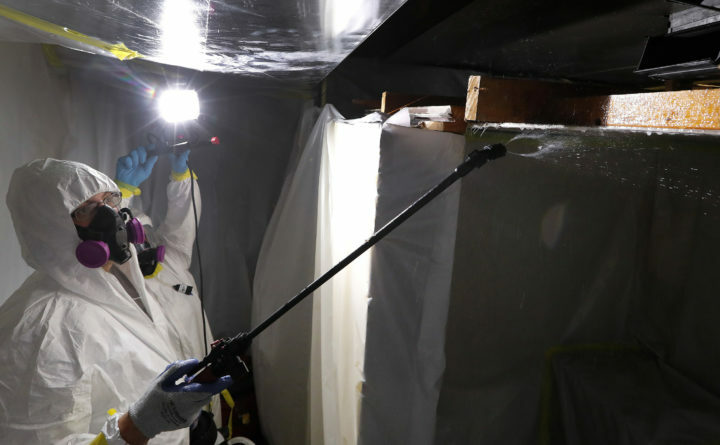 The review began under Trump’s predecessor to make sure proper safeguards are in place for asbestos and other toxins in homes, offices and industrial plants across the United States. Twelve years ago, my life was irrevocably altered by an environmental toxin. I was diagnosed with malignant pleural mesothelioma, a cancer caused by asbestos exposure. I had been exposed to the deadly fibers as a child from my dad’s work clothes. He worked as a drywall contractor and the drywall mud he mixed and sanded off the walls was full of asbestos. My dad would come home from work covered in a grayish white dust that encrusted the jacket he wore. It was the same jacket I would put on to run out to the garage to feed my pet rabbits, rake leaves or get the mail. This coat was covered in asbestos and each time I wore it I breathed in those fibers. Thirty years later, I was fighting for my life, having been diagnosed just three and a half months after the birth of my first and only child. I lost my left lung and my career. The first years of my daughter’s life are a blur because I was undergoing intense treatment to irradiate the cancer from my body. I’m glad to say the treatment worked, but I will always live with the fear of the cancer coming back. My daughter has the unfair burden of knowing her mom’s life hangs in the balance. It’s all because of asbestos. The Environmental Protection Agency is tasked with protecting people by establishing regulations. It would be nice to think of the EPA as a knight in shining armor, rushing in to save the environment. But in fact the EPA, like any government organization, is only as good as the administration in charge. And today, the EPA is less of a knight in shining armor than a black plague that swoops down and wipes out any good that’s been done in the past. As a candidate, Donald Trump vowed to abolish the EPA. As president, he appointed Scott Pruitt, who as the attorney general of Oklahoma sued the EPA more than a dozen times, to lead the agency. At his confirmation hearings, Pruitt refused to commit to taking action to outlaw or further regulate asbestos. Pruitt has recently come under fire for various ethics violations, ranging from outlandish travel expenses, to his $43,000 soundproof phone booth, to approving huge salaries for his closest aides. When I read the allegations against Pruitt, I think of all of the people I have come to know who have been harmed by asbestos. I see their faces every time I log in to Facebook. They number in the hundreds now. I would be happy to tell Pruitt about it. I may not be a multimillion-dollar company, but I know about the dangers of environmental contaminants through personal experience, and I’m not afraid to talk about it. One voice isn’t loud, but a growing number of people are speaking up, so Washington won’t be able to ignore us much longer. We may even someday get an EPA that cares as much about the environment as it does about the ability of polluters to get rich. Heather Von St. James of Minnesota is a wife, mom, and 12-year mesothelioma survivor, dedicated to advocacy and raising awareness of the disease and its cause. This column was written for the Progressive Media Project, which is run by The Progressive magazine, and distributed by Tribune News Service.